At the risk of sounding like Phil Rosenthal in the Netflix series 'Somebody Feed Phil', whose positivity we just love, I must say that I have not been as happy while visiting a new restaurant in Mumbai in a long time as I was when I went to Cafe Irani Chaii in Mahim on Friday. Cafe Iranii Chai is not really 'new' one could argue. It has been in business from 2015. However, it claims to be the first new Irani owned Irani cafe to have opened in the last 50 years and that counts for something! While I had heard of the place before, this was my first visit to it. The occasion for the outing happened thanks to my senior (as a writer) and now friend, Pritha Sen, food researcher and the brains behind the Bengali menu at Mumbai and Goa's Mustard Restaurant. I was supposed to meet her for lunch that afternoon. She told me that she wanted to go to an Irani cafe and it had to be one near Lower Parel so that she could get back to work at Mustard (which is at Worli) soon. The problem was that most of the Irani cafes of Mumbai are located in south Mumbai and there is nothing of note that I know of in this area. That's when I thought of going to Cafe Irani Chaii, even though it is relatively new. I knew from media reports that it had been set up by an Irani documentary film maker from Mumbai, but that's all I knew about it. I decided to take a risk and go there. Pritha and I both couldn't stop grinning from the moment we entered restaurant. She told me that she felt as if she was getting the quintessential Irani cafe experience even though I had warned her that it is a new place. The genuineness of the place touched a chord with her I guess. I have often tapped Pritha's expertise and knowledge while writing on Kolkata or on Bengali food. This was payback time as I shared with her whatever little I knew about the Parsis and Iranis and their food and culture while we had lunch. Two Bengalis at an Irani cafe and a rare image of Pritha Sen being lectured to. For me, there was a sense of coming home the moment I stepped in. The tiny restaurant looked like an exact replica of the venerable Irani cafes of south Mumbai with its carefully chosen wooden furniture and embroidered table cloths. Later a Parsi uncle appeared too, a recent recruit to the staff it seems, to complete the picture. When I told him that I am a Bengali married to a Parsi girl he said, 'congratulations, very nice,' and gave me a warm handshake. 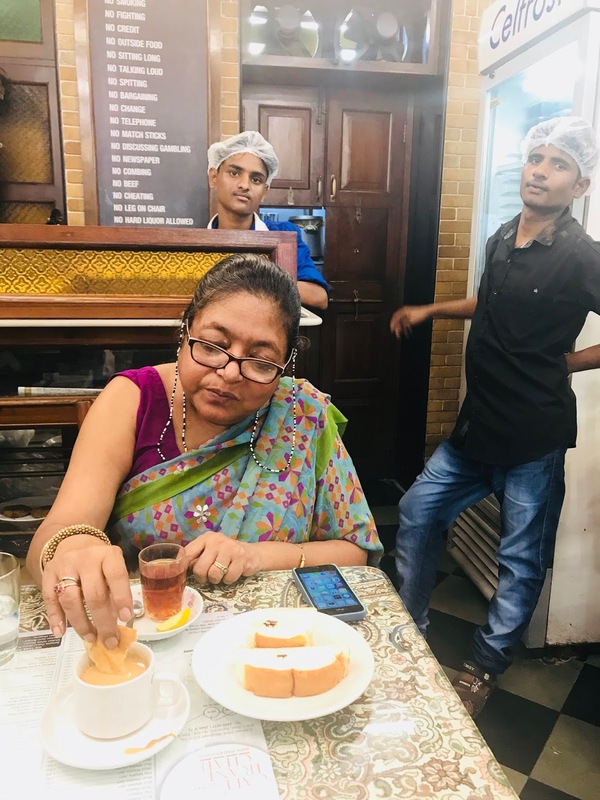 There were jars of cakes and toffees at the entrance to remind us that the Irani cafes of Mumbai were originally provision shops set up by folks who had migrated to India from Iran in the mid 1800s and who then thought of serving food at their establishments. Like the Irani cafes of south Mumbai, Cafe Irani Chaii too is not air-conditioned. There was a samovar kept in the corner to represent how tea was made earlier. Do keep in mind that Cafe Irani Chaii was set up by a documentary film maker. Film makers of course are experts at creating sets which are illusions of reality. Was that the case with Cafe Irani Chaii too I wondered? 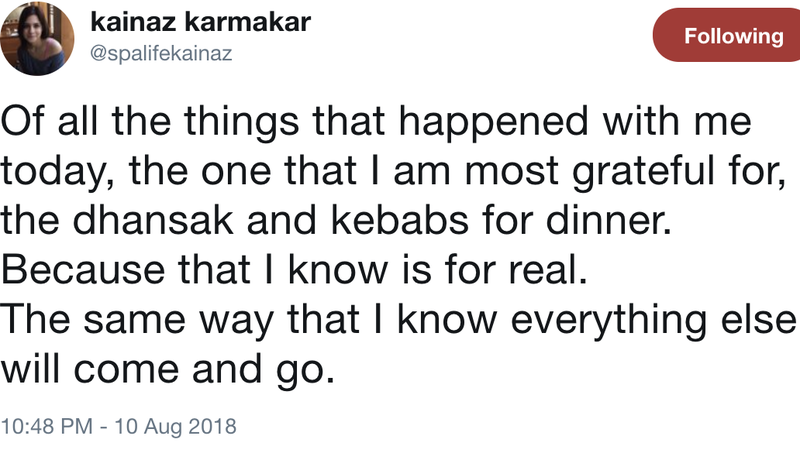 Was it an Irani cafe at heart too? Or just in appearance? The answers were clear. 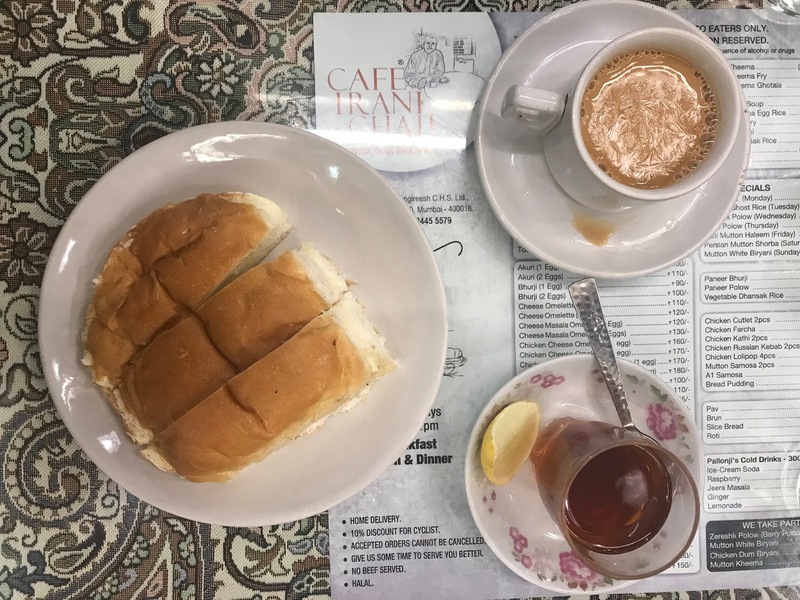 Cafe Iranii Chai is clearly an able inheritor of the great legacy of the Irani Cafes of Mumbai that it seeks to draw upon. Let me explain why I think so. To start with, the food was rather home styled. The chicken dhansak's dal (mutton was not available) was light coloured and thin in consistency and not the dark brown and thick one that often finds in Irani restaurants. Strangely enough, it had a potato in it. The caramelised rice was flavoured just right and texture was fluffy too. This is the sort of dal which my wife has grown up on and likes. I packed a bit for her to have along with the kebabs our cook had made for dinner. The mutton kheema that we ordered was mildly and pleasantly spiced and the quality of the meat was very good indeed. The meat was not smelly at all, Nor was there excessive garam masala in it. Two problems that I often have with kheema in Mumbai. This was just right. They had half and full plates of kheema and we went for the former. The serving size was typical of Irani cafes where the portion size is appropriate for one so there was no waste and the price remained reasonable. The breads were of excellent quality too though the young waiter had no idea where it was sourced from. I am sure that the supply chain decision had been made with a lot of earnestness though. What was on offer was good food. Honest food. The sort of food that strained neither your wallet nor your digestion. One thing which intrigued Pritha was how there was a strain of sweetness that made its presence felt in most of the food. This was particularly true of the akoori. The akoori (Irani/ Parsi spiced and creamy scrambled egg) was creamy just as it should be, as taught to me by my wife. 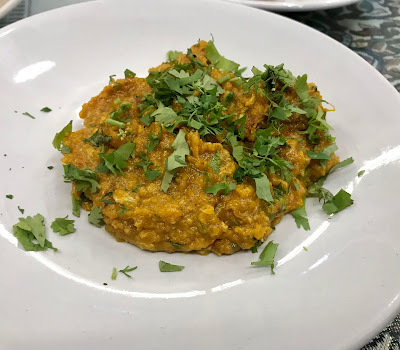 Not the hard, bhurjee like nonsense that I have found served as akoori in some non-Parsi modern cafes these days such as at Jamjar Diner and Salt Water Cafe in Bandra. However, the akoori was sweet. Very sweet. Almost like a custard. I asked the young gentleman sitting near the door whether this was meant to be the cream and dry fruit based 'Bharuchi akoori' and not a regular akoori. "This is how we make akoori at home," he explained with a warm smile. Turned out that his name is Hassan. He is the son of Mansoor Showghi Yezdi who had founded the place. From Hassan I found out that while they are Iranis, they are Muslim Iranis. Not Zoroastrian ones. Which possibly explained the slight variations from the flavours I am familiar with in the food and the sweetness of the akoori. Or even the alu (poatato) in the dhansak. 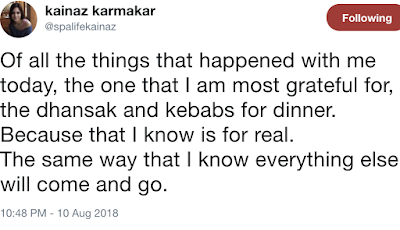 The kofta was from the Muslim Irani tradition too. "We are the same people. We come from the same stock and the same land. It's just that our faiths are different," explained Hassan to me with another big smile. I told him that I had lived in Rasht in Iran for a year as a kid with my parents before the Islamic Revolution. Hassan, who has visited Iran more recently told me that it is a lovely country today and that the people are most friendly. He corrected my pronunciation of Rasht too. It is not Rasht, as in rash-t, the way I said it, but Rasht as in rush-t it. Turns out the that finding a cafe in the city, that I had not been to before and that I would love to go back to, was not the only thing that I learnt that lovely afternoon. I felt that I had made a new friend in Hassan that afternoon and had discovered a new favourite restaurant in Mumbai. In fact we ordered an astonishing amount of dishes which also included chicken farcha (leg piece as per my request), Pallonji raspberry drink, a mutton kofta curry, chai (tea) and bun, brun and pao and an akoori (one egg) for an astonishingly low spends of Rs 1,024 (the berry pulao at Britannia today costs Rs 750 today but they do like to milk their brand). What our bill told me that Cafe Irani Chaii is one of the rare newly opened eateries in Mumbai which aims to cater people who come to a restaurant to fill their stomachs and not those who come to have an 'experience.' It is about sustenance eating here and not indulgent eating. This is the sort of place where the bulk of India still eats. That's why I said that this place is all heart. PS: I later learnt that the extra i in the 'chaii' in their name stands for the spirit of Indo Iranian friendship as espoused by the Yezdis.